All of Dalhousie’s teams (O,D,ST) executed better than Holland College in what was the wild, windy, wet and weird weather of the Atlantic Football League’s tenth-anniversary championship. 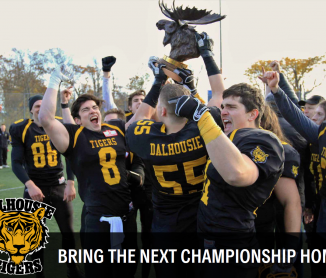 The Dal Tigers completed their second undefeated championship season in three years with a 27-3 victory over the Holland College Hurricanes in what was a near hurricane. Dalhousie opened the scoring in the second minute, as Eric Purcell fell on an errant high snap to the punter for the touchdown which Malcolm Gascoigne converted. The Tiger D forced a Hurricane safety and a27 yard Gascoigne field goal left Dal up 12-0, at halftime. QB Chris Duplisea connected with Jack Underhill on a 22 yard TD late in the third which Turner King converted. Earlier in the Q, Gascoigne picked up a single on a missed 37-yard field goal. A William Kenneford INT near center field stopped one of Holland’s drives. LaterDal gave up a safety and a punt single by Matthew Kaye-Mitchell provided the hurricanes only scoring. A torrential downpour opened the fourth Q and lasted the remainder of the game. Robbie Holland’s fumble recovery of a ball that slipped out of Brady Crowe’s hand while scrambling midway through the 4th, set up a 28-yard major by Zacchary Kuhn. Kinal made the point after, leaving the final score at 27-3. The Dalhousie Tigers graduate eight players this season. All of whom could be potential league all-stars come voting time. They include: Giovanni Holmes, Allistair Chauhan, Zack Leger, Guillaume Bernier, Chad Kirkhus, Samuel Jennings-Lindsay, Tommy Panther, Jesse Legault and Max Martin. But Coach Haggett can be reassured that his returning 47 can’t wait to fill their spots. The success the Tigers have experienced, especially over the past three years will also bode well for new talent coming to Tiger country!